SAN FRANCISCO – Google Cloud may have been a late arrival to the Canadian region among public cloud competitors, but that hasn’t stopped it from winning some contracts with major Canadian brands. Google Cloud Platform’s Montreal data centres weren’t a response to any competitor presence, says Jim Lambe, the country director of Google Cloud in Canada. It’s simply part of the platform’s international expansion plans. Part of that plan is a focus on certain key customer verticals such as financial services, media and telecommunications, retail, and technology. “The goal is to establish an anchor tenant in each one of those, to establish credibility and references for best practices,” he says. So who are the four Google Cloud customers in Canada that serve as a model for each of these industries? Lambe pointed to the examples and two of them spoke at the Google Next conference this week. Here’s the list and what we know about how these firms are using Google Cloud. Though it lacks an official case study with Google Cloud, Scotiabank presented on the main stage at a 2017 event hosted by Google Cloud in Toronto. It’s a user of the Google Cloud Platform, and has created its own in-house ‘Accelerator’ framework on it. It’s a standardized pipeline that’s used to automate deployments, approval flows, and to build out proof of concepts. In his presentation, Arbuckle hammered home the message that “the cloud is a method, not a location.” Enterprises should be focused on the value of the work they’re doing with the cloud, not where it’s residing, he said. Scotiabank also announced a software release of its own at Google Next, putting a component of its Accelerator Pipeline onto the open source community Github. This component will help other enterprises that are working to deploy Scrum and Agile work methods by automating certain functions of application creation. Thanks to Accelerator, Scotiabank says it’s cut the time taken to prove new services meet control standards from one month to one hour. Loblaw Digital is using Google Compute Engine, BigQuery, Cloud Storage, and Stackdriver. Its published a case study with Google Cloud, saying its “on a mission to constantly improve the customer experience, gradually moving its critical systems to Google Cloud Platform.” The case study details how Loblaws has migrated its online ecommerce system built on SAP Hybris. Loblaws worked with Google Cloud’s Profesional Services team for a six-week planning and design engagement, also working with Google Cloud Partner Publicis.Sapient. It also uses Google BigQuery, a big data platform, to power its online Quick Shop product suggestion feature. Rather than just provide suggestions based on what customers bought in the past, Loblaws receive real-time suggestions predicting what they might want in their cart right now. Hesham Fahmy, VP of technology, Loblaws presents at Google Next 2018. At Google Next, Hesham Fashmy, vice-president of technology at Loblaws, gave more details in a “Store of the Future” presentation. The store of the future won’t be about beacon-based shopping experiences and smart mirrors, he says, but about building out a platform that is useful to customers and can be continuously improved. “What customers want to do is come in and get those items into their fridges and pantries as quickly as possible,” he says. Case in point, the Quick Shop feature that was improved with BigQuery is now driving 40 per cent of online conversion. Loblaws’ first step on the journey to Google Cloud was to ensure the security was in place. Since it protects sensitive customer data, it had some compliance concerns to consider. It designed its infrastructure realizing that some parts of it would always remain on-premises, such as its ERP system and inventory management. 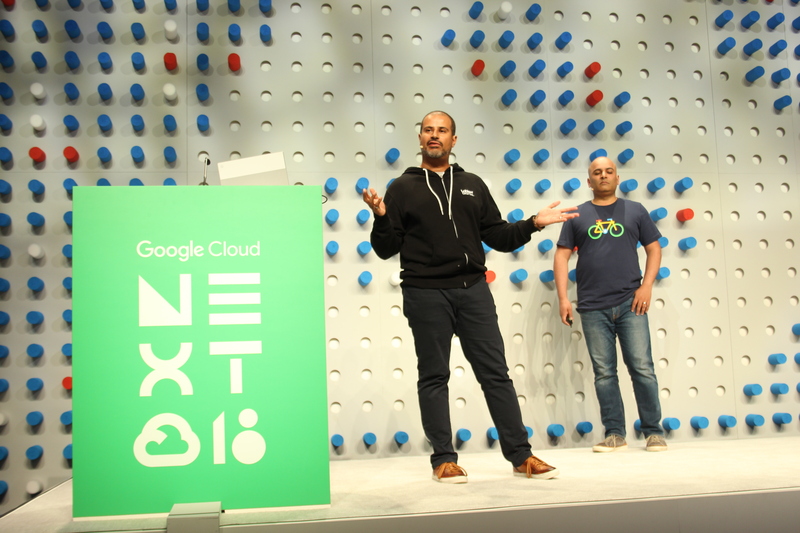 Next, it went to work on a data ingestion layer, moving data from multiple touchpoints – in-store transactions, online data, and loyalty program details – into Google Cloud. With cloud infrastructure in place and the data model cemented, Fahmy says that business problems can be solved with small teams working on them. One challenge it faced related to its new “click and collect” feature that allows shoppers to buy groceries online, then pull into a designated parking spot and have the order deposited into their trunk. First of all, Loblaws had to solve a challenge around predicting “fill rate” of its products. Basically, how could it guarantee what’s available in inventory when a customer places an order will still be there when it’s time to grab it off the shelf? By using Google’s forecasting models, it is able to keep its fill percentage rate in the high 90s. Second, it has to deal with impatient shoppers that pull into the parking space and expect their groceries to appear in fewer than five minutes. To address this problem, Loblaws put together a team of six people that included two developers and two process engineers. They built a mobile app and an in-store dashboard that is triggered when a customer shows up. After building a prototype in two weeks, they put a solution into testing. Now it’s almost ready to go nationwide. “We’re almost ready to guarantee to our customers their groceries will be free if they’re not there in under five minutes,” Fahmy says. Ottawa-based Shopify announced that it’s building out its cloud with Google in a March blog post. As a provider of cloud ecommerce software to thousands of merchants, Shopify has cloud experience that goes back to 2006. It’s resisted hosting its main platform on the public cloud (i.e. Amazon Web Services) during that time. But it did shift more of its supporting services to public cloud, reducing the complexity of its infrastructure as it scaled. After Shopify identified Kubernetes as its ideal container management service, it made the decision to migrate its main platform to Google Cloud. As of March, it had moved more than half of its data centre workloads to Google Cloud. The Montreal-based subsidiary of France-based Ubisoft is known for being one of the largest game studios in the world, producing successful series including Assassin’s Creed, Far Cry, Watch Dogs, and more. A Google Cloud case study details how Ubisoft faced the challenge of building a web-based version of its popular world-building game From Dust. It used Google App Engine and Google Cloud Storage to handle a large number of online gamers. Google’s Lambe also points to Vancouver-based independent games studio Phoenix Labs as an example of a customer in this industry. Google is still lacking the beefy Canadian media customer to anchor its fourth “key veritical.” But give it time.